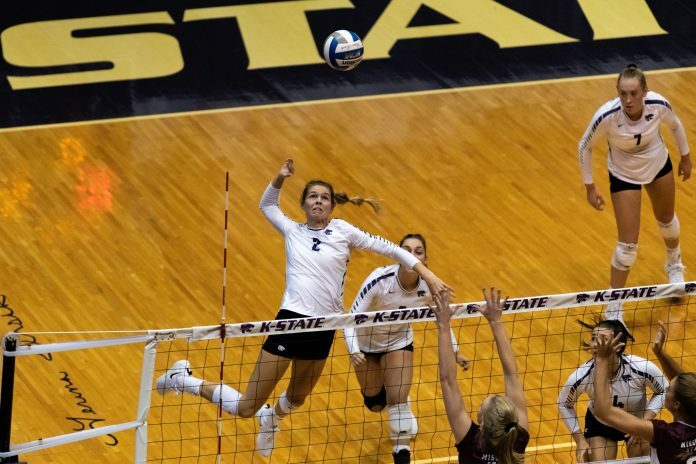 After sweeping a Missouri State team that only lost one set over a span of three matches during the weekend, the Kansas State volleyball team will host the K-State Invitational on Friday and Saturday in Manhattan. Ahearn Field House will be hopping this weekend with Oregon State University, the University of North Texas and the University of Nebraska Omaha in town for six total matches. 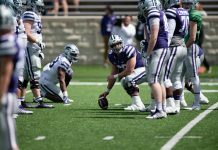 K-State is off to an impressive 5-1 start this season, rattling off with three straight wins. This team returned many players from a 2017 squad that started out just 2-4 in its first six games a season ago. Against Missouri State, K-State defended a set point from the Bears that would have tied the match at one set each. With four lead changes, Kylee Zumach finished out the set with an ace after K-State scored three straight points. In the Wildcats’ last three matches, they have recorded nine aces and double digit blocks. For the fourth straight match, junior middle blocker Elle Sandbothe hit over .300. Over the span of six matches so far this season, K-State has hit over .250 as a team. First up for K-State this weekend is a match against North Texas at 12 p.m. on Friday. North Texas is 3-4 on the year and has lost its last four games. They lost three sets to one against No. 12 Baylor on Aug. 28. The Mean Green are 0-3 on the road. The second match for the Wildcats will be against Oregon State on Friday at 7:30 p.m. The Beavers are 4-1 and have also won three in a row. Their only loss on the year was to Ole Miss in a match that went a full five sets. The Beavers lost two of the first three sets, winning the fourth set to force a fifth. On Saturday, K-State will play Omaha at 6 p.m. The Mavericks are 3-3 overall after losing their first three games this season. In the three matches Omaha has won, they have only lost in two sets. All of K-State’s matches can be listened to on KMAN Radio. The match against North Texas will stream on K-StateHD.TV, and the Oregon State and Omaha matches will be streamed on ESPN3.